Get all the details on the Logitech Circle 2 security camera, including pricing, and all the features that come with this highly rated camera. 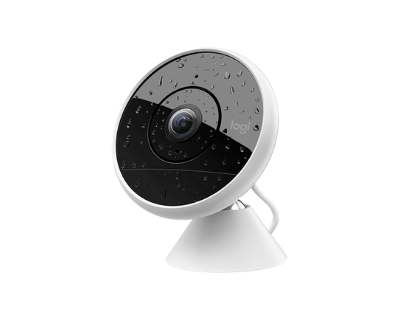 The Logitech Circle 2 is a great standalone security camera or can be part of a security camera system. It features night vision, 24 hours free cloud storage, and high-quality 1080p recordings. 24 hrs free cloud storage. Pros: Great image quality, wider angle than most cameras, great customer support, waterproof. Cons: Wireless version isn't compatible with HomeKit. Overall: Excellent security camera, especially for outdoor use. CircleSafe is an optional subscription plan that gives users up to 31-day cloud storage, person detection, motion zones, and a custom day brief. What is the wire-free Logitech Circle 2 battery life? Battery life for the Logitech Circle 2 is up to 3 months. Do you need a hub to use it with the Alexa? No. You'll just need to connect it to your WiFi network. Do I need a subscription to get phone notifications from the Logitech Circle 2? No, the Circle 2 gives Smart Alert notifications for free. These are push notifications that are sent when the camera detects motion. Can you leave this camera on 24 hours a day? You can, but it will not record for 24 hours - it will only record when motion is detected. You can always view the live feed. What are some alternatives to the Logitech Circle 2? Out of all the HomeKit cameras, it is the best IMO. But overall, It’s decent. It disconnects from my network every so often (nothing else disconnects, checking network logs I find no drops at all when the camera disconnects). Also, for some reason (and I’m guessing it’s because of HomeKit) opening the stream takes quite some time to load, both in the Home app and in Logi. I have another 1080p non HomeKit camera and the stream opens almost instantaneously. Be aware tho - HomeKit only accepts 720p stream (at least that’s what I figured out, correct me if I’m wrong).Bottom line - if you’re going for a HomeKit camera, go for the circle.Oh, and a DISCLAIMER: make sure you got the non wireless one! The wireless battery powered one doesn’t work with HomeKit. I have the original and the 2 wired. For the life of me I don’t get how the 2 is slower in sending notifications than the 1. It takes 2 and sometimes even 5 seconds for it to alert me.Otherwise, image quality is great and the interface is one of the best I’ve ever used. The HomeKit integration with motion sensors are nice, but i get too many notifications when activating it in Home since it doesn’t have any algorithm to differentiate stuff. I’m starting to think majority of ip cameras aren’t really necessary for HomeKit use esp pointed outside. The manufactures own app has a ton of more useful settings rather than just steaming low res vid in the home app. I just got Logitech Circle 2, it's great! Any way better subscription pricing than Nest. App is solid. Hardware is nice with good mounting options. Recommended.